Clean the fish well but leave scales intact. Marinate the fish in gin and pepper for 15 minutes. In a large mixing bowl, combine salt and egg whites. Transfer half of the mixture to an ovenproof dish or jellyroll pan lined with baking parchment. Arrange the fish on top of the salt. 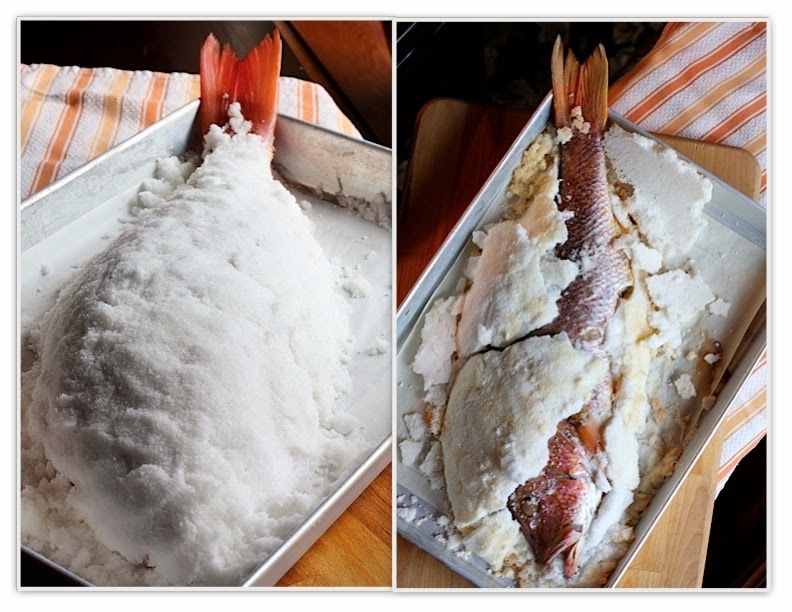 Cover fish with remaining salt. Bake for at least 30 minutes or until the salt hardens. Estimate baking time by measuring the thickness of the assembled fish with salt. Allot 15 munutes of baking for every inch. Meanwhile, make the dressing (recipe follows). When the fish is cooked, crack the salt covering then lift out the fish onto a platter. In a bowl, combine all ingredients using a wire whisk.